Mapping can be very simple: when you draw a sketch of your living room to see where to place your new sofa, you do a map. Mapping is actually a very old activity: First maps were made from estimated distances and orientations ("6 days walking in the direction of the rising sun"). As you may expect, these maps were not very accurate, but however very useful for the traveler. 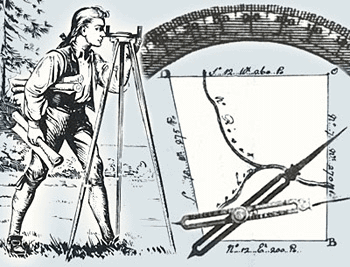 In the 15th Century, the invention of the plane table and circumferentor improved the accuracy of angle measurements, and the usage of more accurate distance measuring tools contributed to improve the quality of maps. The synchronous invention of the printing press contributed to the distribution of maps. The invention of the sextant (to measure accurately the latitude) and chronographs (to measure the longitude) not only contributed to the major discoveries of the 15th and 16th centuries (Cristopher Columbus, Vasco de Gama, etc. ), but also add absolute references to maps. With invention of the theodolite, in the middle of 16th Century, cartography became a mature technology. The principle of cartography was then to determine absolute position of a few points using astronomic measurements, then to complete this network using triangulation. A map can be seen as a bird's eye view of a portion of the Earth. Not surprisingly, cartographers were very interested by gaining this bird's eye view, using the first aeronautical platforms. Maps were drawn by observers from hot air balloons. As soon as photography became available, it was obvious that mapping will be more comfortable if done from photographs taken from balloons. This was the invention of aerial photography, another important milestone in the history of cartography. Of course, as soon as airplanes became safe enough, cartographers installed photographic cameras on it. World War I can be considered as the birth date of modern cartography. Since then, spectacular technological improvements were made to films, cameras, navigation systems, and of course to airplanes, but the principles are still the same.A camera is mounted in a plane, aiming vertically. Each photo covers an area of the surface of the Earth with an extend depending on the altitude of flight, the viewing angle of the camera (given by the focal length of the lens) and the size of the film. Nowadays, most aerial photos are taken with large format cameras producing 23x23 cm negatives.To cover an area with aerial photography, the plane will flight along straight lines. Based on the coverage of one photo and the speed of the plane, the time interval between pictures is calculated, to allow a small longitudinal overlap between 2 successive pictures. When the plane reaches the end of the area to be covered, it makes a U-turn, and starts a new flight line, parallel to the first one, and at a distance allowing for some lateral overlap (usually 20%). With this organisation, it is possible to completely cover the area to be mapped. Human vision is an extremely sophisticated mechanism. Part of it is our ability to accurately perceive distances (three-dimension - or 3-D - vision). 3-D viewing is to a large extent based on stereoscopy: each eye observes a scene from a slightly different point of view (our eyes are placed a few cm apart) and send 2 slightly different images to our brain (check by alternatively closing left and right eye when looking to a scene with some elements in the foreground - your finger for instance -). Our ability to perceive distances is however limited to a certain distance: it is difficult to analyse depth on objects located at more than 100m. This is because our brain actually analyse differences of angles between the images sent by the 2 eyes. The average distance between the eyes is around 7 cm. Increasing the distance between the 2 viewpoints will increase these angles, hence the possibility to perceive depth. This principle is used by prism binoculars. Besides their magnifying effect, the prisms increase the distance between the 2 axes of view, giving a much more efficient perception of 3-D (this effect is not as important with pocket binoculars, where the front lenses are not more spread than our eyes, but the effect is maximum when using big marine binoculars, with a distance of nearly 20 cm between the front lenses - assessing distances is very important on see -). With wide binoculars, the 3-D perception is even "exaggerated"; this is know as the hyper-stereoscopic effect. When flying in a plane at an altitude lower than 100m in a plane, we get a good perception of the relief, but climbing higher, the stereoscopic effect vanishes, and the relief of the Earth appears nearly flat. To recover 3-D view when flying at 5000 m, we need an interval between the 2 view points (the "stereoscopic base") of approximately 5000 / 100 * 7 cm = 3.5 m. If one wants to benefit from hyperstereoscopy to better analyse details of the relief, the distance between 2 viewpoints (or the 2 cameras installed in the cabin) should be a few meters, witch is not possible on most planes. Stereoscopic aerial photography is based on a trick: instead of taking 2 pictures simultaneously (with 2 cameras), it is possible to recreate a very wide stereoscopic base by taking successive pictures along the flight line. With a proper interval, each photo will have a 60% overlap on the previous. This overlap area is then seen from two different viewpoints, allowing for hyper stereoscopic view. All aerial photography acquired for cartographic purposes are based on this principle.Using stereoscopic aerial photos, it is possible not only to perceived differences of elevation, but also to measure it. This operation is called stereo-compilation and requires sophisticated equipment and high skills. Stereo compilation can be used to accurately measure the height of objects such as trees, buildings, etc., but also to draw lines of equal elevation on the photos. In the same process, the plane coordinates of the objects can be extracted from the photos. This technique is used since more than 50 years. It does not completely replace topographic field surveying (some elements such as village names are not visible on photos), but drastically simplified (and made more accurate) mapping, especially in difficulty accessible areas. Recent developments of this technique correspond to the introduction of computers. Some hybrid solutions are still used successfully (analogue compilation with digital output), but the trend is clearly now towards fully digital solutions (the aerial photos negatives are scanned prior analysis). The stereo compilation process is used to analyse the height of the objects, but also their position. This is not an easy task, because an aerial photo does not perfectly match a corresponding map: the photo is a conical projection (around the optical centre of the camera) while a map is an orthogonal projection. Knowing some parameters (geometric properties of the camera and lens, attitude of the plane at picture time, terrain elevation, etc. ), it is possible to take into account the distortions of the photo to transform "photo-coordinates" of an object into "map-coordinates". This is usually done for each object visible on the photos, and drawn on the map.If one applies the same principle not only to the mapped objects, but also to every point of the photo, the whole photo will be geometrically corrected and will be assimilated to a map. This process is called orthorectification, and the result is an orthophoto. It's a fully digital procedure, very computer-intensive. As they all have compatible geometry, orthophotos generated from different photos can easily be merged together in a seamless mosaic (this cannot be done from uncorrected aerial photos). Precise coordinates of a few points are needed to produce accurate orthophotos (the same is true for stereo compilation). Ideally, these points should be marked on the ground before the photography mission. With the latest development of the software, only a limited number of marked points are required along the border of the area covered.